However, I’ll admit most developed market currencies exhibited a fair amount of mean-reversion in the past 3-4 decades. But in the last decade we seem to have entered a new paradigm of lower GDP growth, permanent deficits, political paralysis, aging populations & increasing entitlements, and ever escalating government & private debt. Not to mention unprecedented qua…money printing! Can currencies continue to self-correct in that environment? Perhaps, but they might just reach a tipping point instead. If certain European currencies still existed, how far do you think they would have fallen by now..? Personally, you might balk at such a ‘big bet‘ on currencies…except, by not making it, you do know you’re simply making another bet instead?! But maybe I’m completely wrong, developed markets may simply be in a desperate race to the bottom, so their currencies may actually remain quite well aligned… Against each other, I mean! But not to emerging/frontier market (& certain other) currencies, I suspect… If you want to preserve & increase the real value of your savings, that’s the exposure you really need. The majority of those countries have higher GDP growth rates, lower debt levels, lower entitlements & actual surpluses, and far younger populations! That provides a powerful tailwind for their currencies (and stock markets). Right, where to start!? Well, clearly I’m trying to escape ‘home bias‘, and I’ve got precious little time for benchmarking… The UK‘s at 3%? And where the f**k’s Europe? Oh Jesus – he doesn’t even have a US category, this has to be a bloody joke..! Well, no, it’s not…any type of benchmarking (conscious, or unconscious) is an obligation I just don’t need. Of course, this doesn’t mean I ignore investment opportunities in those markets. Nope, always looking..! And I do find compelling individual stocks, but the US/European macro environment’s a huge black mark against them. Instead, why not buy an equally attractive stock in a market that offers a macro tailwind? However, I do think there’s huge opportunity in US & Euro distressed/discounted assets & special situation stocks – I write in greater detail about that here. There’s also the question of price/value, is a difficult market worth buying if it’s cheap enough? Well, perhaps – but if I average out various P/E measures, I believe the US is on a 14 P/E, Europe‘s at 10, while the emerging markets are somewhere in between… Really, which do you think screams the best relative value?! Actually, there’s another method I rely on, which is just as good as evaluating absolute/relative P/Es: Fund discounts. No point in bothering with NY closed-end funds (discounts?! ), but I recommend you monitor all investment trusts/companies in London. Always informative, and well worth it – discounts across a sector are a great signal a market/region’s finally cheap enough to buy. One might naturally assume, therefore, the absence of major markets accounts for plain vanilla Equities comprising only 42% of my portfolio? Again: Well, no, it’s not..! Equities are (in theory!) the riskiest part of my portfolio – I want to offset & diversify away as much of that risk as possible in the rest of my portfolio. And I see a lot of intriguing opportunities in other asset classes also. Broadly speaking, I would divide my portfolio into Equity, Real Asset & Absolute Return investments. The last two could also be classed together as Alternative investments. I guess it’s my personal barbell strategy: The more lower risk/correlation investments I introduce in my portfolio, the more aggressive I can be in my equity allocations & investing. I believe this will help me outperform (as does value investing!) in the long-term, and enjoy lower average volatility (more commonly known as a better night’s sleep…). If you believe emerging/frontier market stocks are little too risky for you (I disagree, how did the developed markets treat you in 2008? ), this approach might be worth a try. And if you don’t have (much) Alternative investments in your portfolio presently, so much the better – there’s a whole host of other opportunities for you to now consider! All in all, in terms of risk control, diversification & other attractive opportunities, I suspect equities will probably never exceed a 50-60% total allocation in my portfolio, even at my most bullish. Of course, I’m exaggerating the benefits I enjoy here a little… I inevitably express my investment ideas via equities, whether it’s through companies, closed-end funds or ETFs. This obviously can still leave me vulnerable to equity market trends & sentiment, even if I’m dead-on with my alternative investments. For example: When London’s doing badly, check foreign funds listed there – even if their NAVs are holding up, they still get marked down & their discounts widen..! The same is true of property companies. And let’s not even speak about the gyrations on agri/resource stocks..! I could, of course, explore making more efficient (& more complex!) non-equity investments, but that’s a v different ‘job’ & portfolio. Take that path, and I might as well just trade FX all day long – and I probably wouldn’t be writing this blog either..! 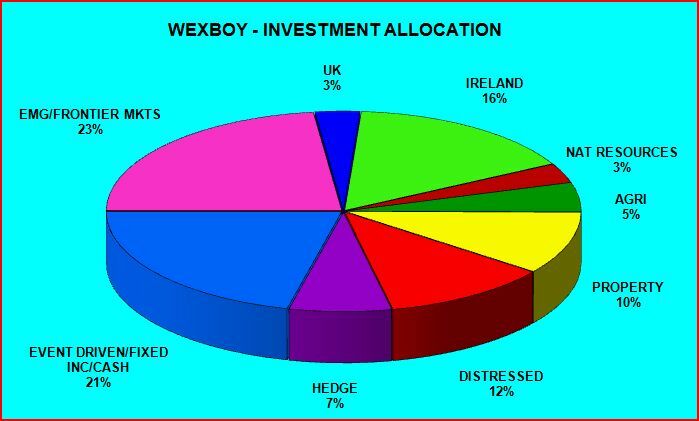 OK, next I’ll take you through each of my investment allocations – and try to give a flavour of my thinking, and some underlying stocks/funds, in each instance. Regular readers may recognize some of the investment themes & stocks, but hopefully this will still be a useful & interesting overview. For new readers, this will ideally be a nice introduction!